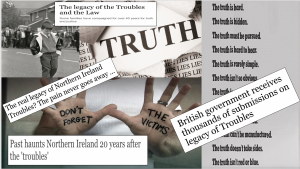 Victims and Dealing with the Past team member Dr. Cheryl Lawther presented at an event on ‘Victims, Perpetrators and the Legacies of Violent Conflict’ at Queen’s University Belfast on 7 February 2019. The event was organised by Professor Richard English and chaired by Prof. John Brewer. Cheryl spoke alongside Professor James Waller, the Cohen Professor of Holocaust and Genocide Studies at Keene State College, New Hampshire. Their presentations were well received by a diverse audience. 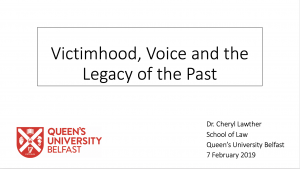 A copy of Cheryl’s presentation is available on request.